Recently I had the opportunity to attend Bushwick Open Studios, a three-day arts festival that celebrates the neighborhood's exciting arts community. I visited a number of open studios and galleries, and was also invited to be in an incredible two-part show organized by Julie Torres, called "What I Like About You" (although sadly, I missed out on the first part due to time constraints). Torres invited artists from outside Bushwick to be in the show; and they in turn selected local artists whose work they admired. I had a chance to talk with artist and organizer Julie Torres recently. JS: Can we talk about the evolution from the show in your apartment 4 years ago to last year's event at Norte Maar to this year's show? How is it to "organize" 40 artists from around the world? JT: Well, the apartment show was totally inspired by Jason Andrew's Norte Maar apartment gallery, so it made perfect sense to curate the first BOS collaborative show there with Jason 2 years ago (So Happy Together). I pitched last year's iteration to him (Alltogethernow) but he already had plans for the space... So I pitched it to Rob de Oude and Enrico Gomez of Parallel Art Space -- but they already had their show lined up too! We wound up launching Alltogethernow in an empty retail space on Starr Street, which turned out to be a great spot. After that, Parallel generously invited me to do something in their space for this year, and I jumped at the chance. It was very kind of them to trust me, and all these people, and this whole crazy process........ It's really a lot to take on. It was a total leap of faith on their part. I'm so appreciative. Oh and to answer your question, organizing 41 artists is...... hard. JT: Aligning 41 artists from several countries for 3 huge collaborative events, plus housing and transportation is just... hard. Period. But I wouldn't change a thing! I am slowly learning to take on difficult projects that excite me, and to allow myself to be afraid -- VERY afraid -- and to simply do it anyway. I am finding that if I am prepared to work, then it will work. The magic word appears to be: WORK. JS: It's true, the artists came not only from all over the US, but also from as far away as the UK, Spain and the Netherlands. The show ended up in two locations. How did that happen? JT: The wonderful artist Garry Nichols happened! While I was knee-deep in the planning stages of 'What I Like About You' (for Parallel Art Space, Bushwick Open Studios 2013) Garry mentioned that I should visit Imogen Holloway Gallery in Saugerties, NY to take in the current show, and to meet the energetic Diane Dwyer. Garry had a hunch that she and I should connect -- And he was right! Diane is a fan of many of the artists included in last year's iteration of our show (Alltogethernow), so I pitched the idea of a sister show upstate at Imogen Holloway (about 100 miles north of NYC), and she went for it! It has been fantastic to work with her. JS: How do you find your artists? I know you talked about this at some length in the interview you did with the directors at Parallel Art Space, Enrico Gomez and Rob de Oude. JT: Through the worldwide web! We all follow some great art blogs -- Studio Critical, Painters' Table, Structure and Imagery, Two Coats of Paint... And it's become really easy to reach out to the artists we discover there, via Facebook and Twitter. So I met everyone in the group that way, and I met lots of the artists face-to-face for the first time at Parallel. JS: Yes, meeting everyone for the first time was incredible. And the collaborative aspects were crucial, it's true -- from the naming of the show to the hanging of the show. Even the night before was a collaborative painting party -- Can you talk about that? JT: That's why the title of our show, 'What I Like About You,' is so perfect -- And I must thank you for that, Julia! I was desperate for ideas and asked the group to please help -- and you delivered! Everyone agreed immediately that it was the right choice. It was that clear. That's one of the reasons I love collaborating -- By sharing our ideas, experiences and knowledge with each other -- we transcend the limits of what any of us can do on our own. Our project is the result of over 40 artists working together, and I think that shows..... that it elevates what we are doing, and what we are communicating to anyone who visits the exhibit and sees the work. I've heard such positive reactions from people, and I honestly believe that's why. I think our joy in working together is evident. A huge part of what these shows are about is connection, community and collaboration. Like last year, I wasn't able to include artists who wanted to be in the show, but were unavailable to come to Bushwick to collaborate with us on new work and on the install of the show, or to visit Bushwick artists' studios -- to actually meet and work with the artists who are HERE. That's what this whole project is about -- Bridging the gap between online community and real life community. Getting to see all those connections take place on the ground here in Brooklyn, and continue to grow after the show opened, is pretty magical. JS: Absolutely true. It was a great experience to come and not only meet people, but visit their studios and paint with them. I found it to be a very welcoming community, exciting and exhilarating. The painting party included New York City luminaries like Farrell Brickhouse and Katherine Bradford painting alongside visiting artists. The energy was infectious. Also, You make a distinction between 'curating' and 'organizing'; why is that important? JT: In the case of these 2 shows (and some past ones too) it's a very important distinction to me. Both shows were curated collaboratively, as a group, by all of us. I invited lots of folks -- and whoever came, came. In the case of the Parallel show, you were each asked to invite a Brooklyn artist, and I made a conscious effort to have very little say in that -- So in fact, half the show was curated by you guys! We chose the work from several options per artist, and decided together how to hang each piece. As you know it wasn't always easy, but I think the result is so much more exciting than anything I could have come up with on my own! I love both of these shows, and I am so proud of them -- and of us! JS: What's next for you? as an artist and also as a curator? should we expect to see another version of 'What I Like About You' at next year's BOS? JT: Well, I am always making new work, and always daydreaming of shows I hope to put together..... I currently have a bunch of my own paintings up at Ground Floor Gallery in Park Slope (at 5th St and 5th Ave), a new space run by Krista Saunders and Jill Benson -- On view through June 30. And -- Yes! I do hope to organize or participate in some sort of extension of our show at next year's BOS........ but I simply can't think about that yet! JS: Thanks for taking the time to speak with me, and for all your efforts on this show and elsewhere! 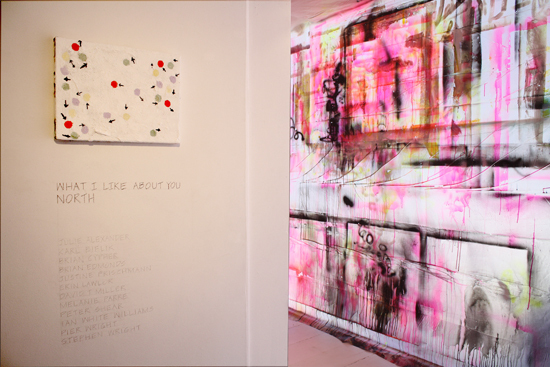 What I Like About You is on exhibit at Parallel Art Space through June 30th.